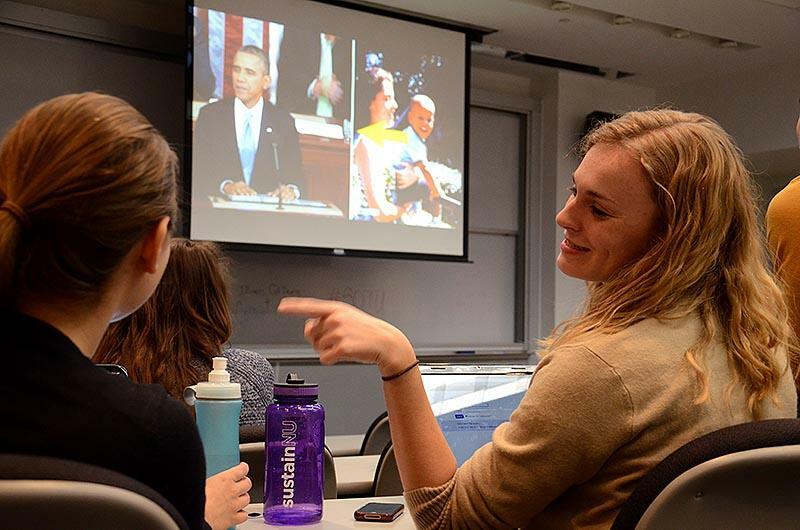 Northwestern students watch President Barack Obama’s State of the Union address Tuesday night. College Democrats held a viewing party in the McCormick Tribune Center. President Barack Obama delivered his sixth State of the Union address on Tuesday before a divided Congress ahead of November’s midterm elections. About 20 members of College Democrats gathered inside the McCormick Tribune Center to watch the address. Throughout the speech, the president asserted his power to carry out executive orders in front of Congress. The president’s commitment to raise the minimum wage to $10.10 an hour drew cheers from some members of the group. He said women were hurt by “stagnant” wages because women earn less, on average, than men do. Obama also promised to order the U.S. Department of the Treasury on Wednesday to create a retirement fund called MyRA to address inequalities in retirement savings. He urged Congress to make the fund available to all working Americans. College Republicans president Rebecca Schieber said the hopeful tone of Obama’s speech contrasted with the starkness of the stalemate Congress finds itself in. Throughout the speech, Obama indicated he may bypass the legislature to boost the economy and address broad issues such as providing greater support to pre-K education. Schieber expressed concern with Obama’s pledge to use unilateral action. In addition, Obama encouraged Congress to restore unemployment insurance benefits, which recently expired for 1.3 million Americans. In a study for the Institute for Policy Research, Kellogg Prof. Brian Melzer linked dramatic increases in unemployment benefits with stability in the housing market. However, increasing unemployment benefits is a two-sided issue, he said. The president’s speech was infused with a spirit of optimism, said Nicolas Wagner, who attended the College Democrats’ watch party. “Overall, I like how he was able to speak with an air of cooperation and excitement with Congress, but if they were to stonewall him more, he is willing to take control of his own,” the Bienen freshman said. Despite the optimistic atmosphere of the president’s speech, some students from the College Democrats watch party recognized the high stakes environment in which it took place. The speech comes before a midterm election in which Republicans need to recover six seats to take control of the Senate. Kevin Cheng, vice president of programming for College Democrats, said Obama did not go into many specifics during his speech. Given the polarized nature of Congress, Cheng said, the president will have the most success focusing on backing inequality and immigration reforms. “I feel like it comes to a point now (where) it’s tougher to do sweeping changes,” the Weinberg sophomore said. Weinberg sophomore Kenni Zellner said the president was forthright in his remarks to Congress and presented a more positive attitude during his talk compared to last year.